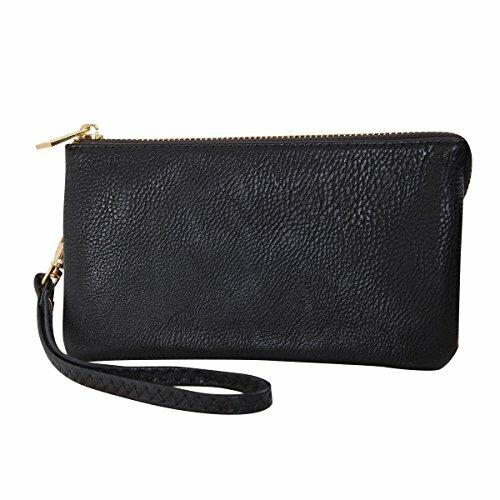 Are you looking for a convenient vegan clutch wallet that you can carry around instead of a full purse? We've put together 10 amazing options that are affordable and easy to organize. Merging a wallet with a purse, this clutch wallet neatly arranges your cards and cash with six card slots, a zippered pouch and three roomy compartments. Made of gorgeous black vegan leather. Comes with a detachable wrist strap with gold-toned hardware. Pros: For evenings out, a little clutch wallet like this can hold all the essentials without all the bulk of a larger purse. Cons: It won't hold a phone over approximately six inches. Each wallet by Sakroots is custom-designed. The Arcadia clutch wallet comes in sleek faux leather embossed with a one-of-a-kind geometric pattern. Blush pink with antique brass hardware. Generously organized with an ID window, 12 card slots and multiple zip and slip pockets. Pros: You probably won't run out of space for all your credit cards and receipts. It's beautiful and unique-looking with a sort of ancient wisdom about it. Cons: There's no wrist strap in case you prefer it attached to your wrist. How fun is this wallet? It's made to look like a crossbody purse in smooth black vegan leather with a funky faux fur handle, but it's actually an ingeniously designed wallet for traveling. Constructed with inner and outer document pockets, six card slots and a pen loop. Advertised as anti-RFID for security from scanner theft. Advertised as vegan: No, but it's all faux leather and faux fur. Pros: What a stylish way to travel. With the pen holder and all the paperwork storage, it really is the ultimate travel wallet. Use it with the attachable crossbody strap if you don't feel like carrying it as a clutch. Cons: You may not be able to fit many bulkier items in it like you would with a typical purse. Shine bright sporting Anthropologie's shimmery gold clutch wallet with a chic chevron pattern. Comes with a removable gold chain strap. Constructed with six card slots, a long zip pocket and a spacious main compartment. Advertised as vegan: No. However, it's made of polyurethane. Pros: Day or night, sprinkle in a little glam with this part wallet, part convertible clutch purse. It can function as a wallet, a clutch bag and a crossbody purse in one. Cons: It's possibly a special occasion sort of wallet rather than an everyday wallet. Luxury vegan accessory brand Matt & Nat is always reliable for style that can be worn to the office as well as on a date. The neutral hue of the Motiv clutch wallet in Cement complements any outfit or activity. Closes with a snap fastener and features a zippered coin pouch. Constructed with an ID window, 11 card pockets and four slip pockets in addition to a bill section. Advertised as vegan: Yes, PETA-approved. Pros: It's sleek, urban and modern. Exchange your current wallet for this one if you need something efficient, handsome and understated. Cons: It's a final sale item, so you wouldn't be able to return it. Stash your passport, cards and cash in this flexible travel wallet the next time you head to the airport. Designed in red faux leather with lovely blue and orange tropical flowers. Folds in half down the middle. Advertised as vegan: No, but it's made from polyethylene faux leather. Pros: Most clutch wallets don't come with reserved space for passports so that they won't get squished. That's where this travel wallet comes in. Cons: The internal organization is simple, which can be a blessing or a curse depending on how much stuff you carry. Express your rocker chick style. This black faux leather clutch wallet is embellished with conical metal studs on the foldover flap for an edgy look. Large enough for most cellphone sizes. Comes with a removable chain strap. Advertised as vegan: No. But it's synthetic leather. Pros: This is another great anytime purse plus wallet with places to tuck away your cards, phone, checkbook, touch-up makeup and more. Cons: The product description says it'll fit most phones, but it sounds like it depends on the model. Some larger iPhones and Samsungs may not fit. This dusty rose faux leather wallet from Roxy can carry your cards, cash, passport and coin change with ease. Zips securely shut all the way around. Made with a clear ID section and long zippered compartment. Pros: The weathered look of the faux leather adds a vintage tone to an otherwise contemporary wallet. It would make a good long or short-distance companion. Cons: It may not provide space for more three-dimensional extras. Then again, it isn't designed to be a purse. Do you think Ziggy Stardust inspired this silver Monki wallet? With a glittery gold lightening bolt across the front, we have our suspicions. Made with multiple inner pockets, card slots and a zippered compartment. Advertised as vegan: No. However, it's 100% polyester. Pros: Embrace the unexpected. This wallet is a conversation piece, so bring it to parties. Cons: You may not be able to use it on the regular depending on your job, wardrobe, etc. 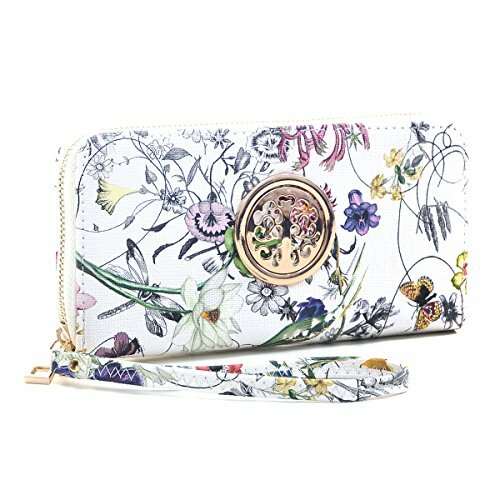 If you've got the winter blues, this springtime floral clutch wallet is the remedy. Made of waterproof white vegan leather with a printed floral design. Features a gold-toned emblem on the front. Zips around with gold-toned hardware and opens up to eight card slots, a zippered median pouch and ample pocket space. Pros: This super affordable clutch wallet is a breath of fresh air on gray days. It's wide and looks like it can hold a decent amount, including a standard size smartphone. Cons: According to reviews, it might require fairly light use to stay functional.